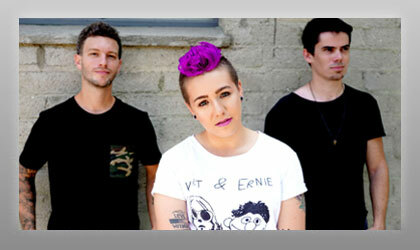 Madyx has co-written original songs with The Nexus (Lana Del Rey, James Bay), Ivor Novello award-winning producer and songwriter Pete Kirtley (Ryan Tedder, Stargate, Sugababes) and has written with various other producer/writers in London, England; Stockholm, Sweden; Berlin, Germany as well as in Los Angeles. She has also worked with GRAMMY-nominated multi-platinum producer Brian Howes (Daughtry, Simple Plan, Hedley) and recently wrote and recorded with the Saint City Orchestra in Switzerland. Her single "Bad Decisions" has earned over 70k streams on Spotify and has earned hundreds of radio plays worldwide on numerous influential stations such as KROQ Los Angeles, KNDD Seattle, KNRK Portland, Radio Doble Nueve in Lima, Peru, Flux FM in Berlin, Germany and Radio 1 across India. This past summer, she headlined Orange County's LGBT Pride event 2018 and performed at two festivals in Switzerland. She will also make her global acting debut in the motion picture Spy Intervention, produced by well-known Hollywood film producer Sunil Perkash (SALT, Enchanted, Premonition), where her music will also be featured in the film. Madyx is putting the finishing touches on her next album which is due for release in early 2019.